I’ve spent a little time looking for information about the ancient Egyptian deity who lies behind the Greek figure of Harpocrates. The results are discouraging, because I find so very little. Admittedly I have no access to Egyptological databases; but I can’t help feeling that if there was much more to know, that the articles that I have read would tell me so. It’s as if we really don’t know that much about large sections of ancient Egyptian mythology. Can that be so? It seems that the word “Harpocrates” is in fact just the ancient Egyptian word “Harpekhered”, rounded off with a Greek ending. The actual word is without vowels, and may be transliterated variously, such as Hor pe khrod, or Har pe khered, or Heru p xrat, depending on how we vocalise the name. 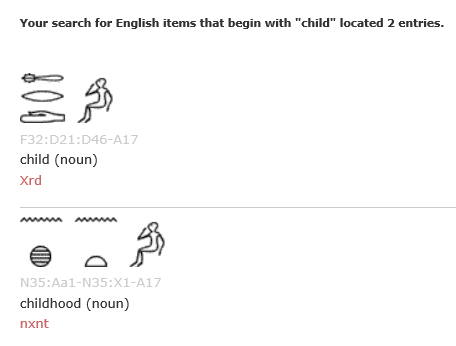 It means simply “Horus the child”. Obviously we would all want to see this name engraved on a monument, attached to a statue or relief of the deity. This would give us a clear indication of how Harpekhered was depicted. They do seem to exist – at least, the Meeks article to which I will refer in a moment says that they do. But I have been unable to find a photograph of any such monument. In fact he also says that depictions of the god appear with someone else’s name on the bottom. Someone like Rameses, for instance. That’s not very helpful. The middle one is the one we want. At the start of the name is the hawk, which Wikipedia (shudder) tells me is the sign for Horus himself. RECITATION. Cobra, to the sky! Horus’s centipede, to the earth! Horus’s sandal has stepped, nãj-snake. 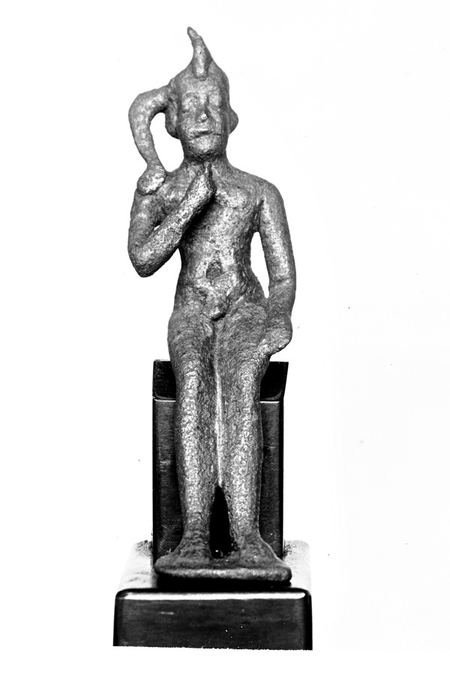 The nãj-snake is for Horus, the young boy with his finger in his mouth. 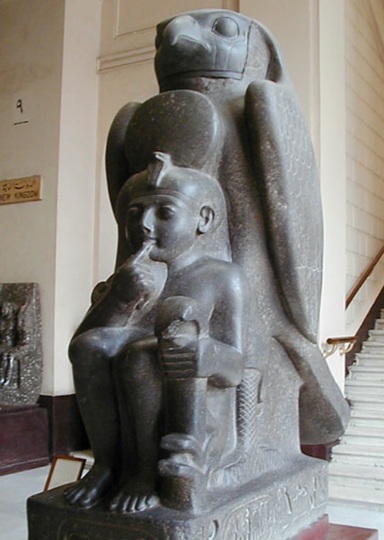 Teti is Horus, the young boy with his finger in his mouth. Since Teti is young, he has stepped on you: had Teti become experienced, he would not have stepped on you. The best information that I could find was in an article online by Dimitri Meeks on the Egyptian iconography of Harpokrates. From this I learn that the “iconographic type is considered a depiction of the new born sun god”; that the actual name first appears late on in Egyptian history, in the 21st dynasty, ca. 1070 BC. It first appears associated with the iconography of Harpokrates in the 22nd dynasty, in the reign of Sheshonq III (835-785 BC). 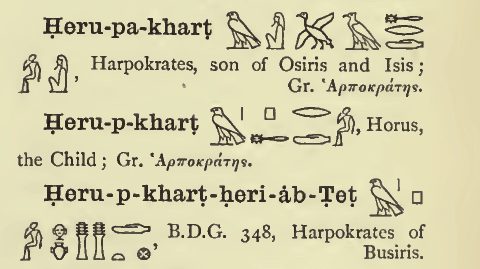 The name of Harpokrates appears for the first time in Phoenician and Aramaic in the 5th century. But … did people worship Harpekhered? Well, there are lots of statues around. What did they do to worship him? Well, I don’t know. Do we even know? Was there a priesthood? I see no information on this. Was there a mythology? I haven’t seen any sign of one. All we seem to have is the name… meaning Horus-the-child. The rest appears to be modern guesswork. Here I find myself stumped. Possibly an Egyptologist, reading this, would guffaw and say, “Well why didn’t you consult xxxxx?” But of course I don’t know anything about xxxxx. The Reallexikon of Bonnet is not online, as far as I know; or I would consult that to see if it gave primary sources. Faced with this, there is not much we can do. If we go back to Acharya S, Christ in Egypt, and look at references to “Harpocrates”, with what knowledge we have been able to glean, we find, as usual, only secondary sources, of doubtful value. This is asserted to “be” that, it is argued; this looks like that, so this is that, or this must be derived from that. Unfortunately without a proper database of ancient Egyptian sources, we are no further forward. Which is a pity. Oh well. We tried! Posted in From my diaryTagged Acharya S, Harpocrates, Methodology9 Comments on Goodbye Harpocrates, hello Hor-pa-khered! In my last post I gathered the handful of Graeco-Roman literary references to Harpocrates, the Horus-the-child deity. But now we must venture behind the ancient world, into an area which few of us know well – ancient Egypt – and try to find some primary sources for the original Harpocrates, whatever his Egyptian name. This leads us into unfamiliar territory, for me at least, and straight into a methodological problem. Greek and Roman history and culture are known to us mainly from literary sources. These reach us, because they were preserved by copying down through the Dark Ages and Middle Ages, and then by printing. The archaeology and inscriptions supplement and correct this picture. For mythology, we have a number of ancient handbooks of ancient myth, like the Bibliotheca of Apollodorus, whose narrative we can use as a frame for archaeology and inscriptions. We also have sculptures, often with a label engraved on them, which tell us what we are looking at. With ancient Egypt, the situation is very different. We don’t have any ancient Egyptian literature transmitted like that. We don’t have handbooks of ancient Egyptian mythology from ancient Egypt. Before the hieroglyphics were deciphered by Champollion, our knowledge was based on shreds of knowledge that had made their way into Greek sources, such as Manetho. It was a wretched level of knowledge, as anyone who reads literature written before the time of Champollion will quickly see. Even so, the list of dynasties of kings that we use today is still mainly derived from Manetho. Even shreds of literary knowledge give us something that the raw archaeology does not. It tends to give us context. But our real hard knowledge of ancient Egypt comes from archaeology; and from the inscriptions written upon that archaeology, supplemented by such literature as has survived on papyrus. There are in fact some dribbling bits of literary material, recovered from tombs or rubbish dumps and preserved by the marvellous climate of Egypt. Indeed one ancient Egyptian legend even managed to survive by copying: by being translated and adapted into Coptic as the Legend of Hilaria, a female monk! But the literary side seems very weak. The result of this is that descriptions of primary material for ancient Egypt quickly turn into catalogues of objects and sites, and the various ways in which the same item is depicted at various dates. We end up with catalogues of lumps of rock. There’s nothing at all wrong with this. This is all good solid hard archaeology. What it tells us, it tells us for certain. That said, we must never forget the maxim, drummed into archaeology students, that absence of evidence is not evidence of absence: That you didn’t find it when you were digging is not evidence that it doesn’t exist. These lumps of rock are our primary sources. But … it is very much harder than many people suppose to write history, or mythology, when all you have is lumps of rock. Even if these have useful inscriptions like “This is Ra, the sun god” on them, this tells you very little about Ra, or how Egyptians thought about him, or his cult. Archaeology is often inscrutable. Men need stories; or rather, narratives. Some may doubt that history from rocks is rather awkward. To such honest gentlemen, allow me to recommend a perusal of the early volumes of the Cambridge Ancient History. Those excellent, careful volumes are based solidly on the archaeology of Sumer, Akkad, and other long gone ancient societies, known to us only from the shovel; and they are hard reading, and harder to digest. So … how do we proceed? How do we learn about the mythology of Harpocrates, as he actually was in ancient Egypt? For the problem with writing history with rocks, is that you have to fill the gaps somehow. “Maybe” is a powerful word. Imagination you will have to use, for imagination is your only way to connect the rocks together. This is not wrong; but it can mislead. One way in which 19th century writers tend to misread ancient Egyptian material is by thinking with their 19th century church-going Victorian hats on. If a temple is a religious site, they reason, then maybe we can compare it to a 19th century church or chapel, in order to obtain some enlightenment. If the inscriptions say that the temples own land and farms, is this perhaps analogous to medieval monastic farming, or priories? In consequence, everywhere in older books on ancient Egypt, there are attempts to understand ancient Egypt as if it was like Christianity. The authors must have known this was not likely to be so; but they worked with the tools that they had. But in reality the term “religion” can blind, rather than illuminate. In our own day, we are told that “all religions are the same”. This is, of course, grotesquely untrue. The consequences of our modern falsehood can be silly, or wicked; or merely amusing, as seen in the tax-efficient career of professional science fiction writer-turned-prophet, L. Ron Hubbard. Failure to recognise this inevitably creates problems. Some religions define their boundaries by their teaching. Accept this and that, and you are in; reject it, and you are out. So Christianity, and Islam. But others define their boundaries by race, or a class, or a social group; if you are born one of us, you will always be one of us, and never mind what you think; if you are a foreigner, you will always be a dirty foreigner. So Hinduism. And some which ought to be teaching-based insensibly slip into being class- or nation-based; so Ulster protestantism and catholicism. Others again define their boundaries by what you do; do the rituals, and you are in; fail to do so, and you are out. I once saw this point made as follows. An ancient temple is not like a church. If you worship the sun, your primary concern is that the sun comes up each morning, and that the drought does not kill everyone this year. You carry out the rituals for a precise, practical purpose. You are a priest: your job is to make sure that Ra comes over the horizon on schedule. In a sense, you are like an engineer in a nuclear power station, rather than a preacher addressing a crowd. Whether you believe in what you are doing is of no importance. And obviously you don’t need a lot of space in which to do your deed. You don’t need a load of peasants underfoot – you have work to do. Now how accurate that view is, I cannot say. But it does fit a lot of what we see, when we look at ancient temple monuments. Obviously it involves a very different idea of “religion”. We have to remember what we do not know; and look for evidence before we claim it. And that may be hard to come by, when our evidence consists of rocks. Let us not say, what we do not know. Let us mark our speculation – which may be a very necessary way to tie the rocks together in some human-intelligible way – as being speculation. None of this is intended as disparagement of archaeology. It is a fine science. Rather it is intended to highlight pitfalls into which we are certain to fall, unless we take steps to avoid them. For us, the rocks are a means to an end. The end is to learn about the myth of Harpocrates. Enough, then, about the problems of archaeology as a source for mythology. In my next post, I will see what I can determine, as best I can, about the ancient Egyptian Harpocrates. It should be an interesting experience. Seated figure of Harpocrates. Bronze, Egypt, Late Period, 664-323 BC. Brooklyn Museum 37.686E, Charles Edwin Wilbour Fund. From here. Posted in From my diaryTagged Acharya S, Harpocrates, Methodology14 Comments on How can we write history or mythology when all we have is archaeology?!? Let’s start looking at Acharya S, Christ in Egypt. In my last post, I discussed how you create a false story about some ancient person or event. With this in mind, I now want to look at Harpocrates, who appears as a key player in Acharya’s book. The central contention of Acharya’s book is that Jesus is really a rebranding of Horus. The rambling nature of her book means that she never comes out and says so, but there you are. And Horus is also Harpocrates, it seems (as well as Osiris, etc; but let’s not get distracted). These gods [Sky and Earth] are the same as those who in Egypt are called Serapis and Isis, though Harpocrates with his finger makes a sign to me to be silent. Isis first invented sails, for while seeking her son Harpocrates, she sailed on a ship. If anything was ever entrusted by a friend to a silent sure one, whose loyalty of spirit is deeply known, you’ll find I’m equally bound by that sacred rite, Cornelius, and turned into a pure Harpocrates. Chapter 19 (358E): Typhon formally accused Horus of being an illegitimate child … Osiris consorted with Isis after his death, and she became the mother of Harpocrates, untimely born and weak in his lower limbs. Ch. 65. (377B): … about the time of the winter solstice she [Isis] gave birth to Harpocrates, imperfect and premature, amid the early flowers and shoots. For this reason they bring to him as an offering the first-fruits of growing lentils, and the days of his birth they celebrate after the spring equinox. 11, 3. … For instance, the cult of Harpocrates near Buticus, or the little town of Butus itself [is equally silly]. They are already elders in years, < but are children in behavior* >, and are compelled by the daemon to enact the imaginary frenzies of Horus at the sacred month. (4) But each citizen—even an elder already far along in years, together with young women of the same persuasion, and other ages from youth up—are supposedly priests of this Horus, and of Harpocrates. Their heads are shaved and they shamelessly carry the slavish, as well as accursed and childish emblem, willingly taking part in the games of the daemon’s initiates laughing madly and foolishly, and cast off all restraint. (5) First they smear their faces with porridge, flour and other vulgarities, and then they dip their faces in a boiling cauldron and deceitfully madden the crowds with their faces, for a supposed miracle; and they wipe the stuff off their faces with their hands, and give some to anyone who asks, to partake of for their health’s sake and as a remedy for their ills. … since in every temple where Isis and Serapis were worshipped there was also an image which, with finger pressed on the lips, seemed to warn men to keep silence, Varro thinks this signifies that it should be kept secret that they had been human. You, as though you were a mute citizen of Oebalian Amyclae, or Egyptian Sigalion [=Harpocrates], were sealing your lips, stubbornly keeping silence, Paulinus. There are also items in the spell books in the Greek Magical Papyri, although they tell us little. Recite often . . . written down . . . to learn something, it is told to you by the god. And if you . . . write . . . and wrap in linen from head to foot . . . , and on the ground draw Harpocrates holding [his finger] to his mouth, and in his left hand clutching a flail and a crook . . . then “ABLANATHANALBA” in wing . . . “ABRASAX”: near the back, “OEAUA” . . . and set the child on it, and write the 5th formula . . .
And whenever you perform this spell, have an iron ring with yourself, on which has been engraved Harpokrates sitting on a lotus, and his name is ABRASAX. From this material, which is entirely Graeco-Roman, we learn that Harpocrates is a child deity, depicted with a finger to his lips, son of Osiris and Isis, who is born at the winter solstice. There is a relationship of some sort to Horus, but it is left indefinite, whether these are two separate gods, or two aspects of the same. However any google search will reveal what the RealEncyclopadie states, that “Harpocrates” is merely a Greek form of an ancient Egyptian deity of the late dynastic period. Will this perhaps give us more? In my next post, I shall look into this. 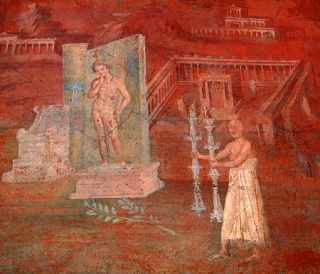 First-century AD wall painting from the Temple of Isis in Pompeii depicts a statue of Harpocrates (son of Isis) in a niche, with a priest with two silver candle holders. (VRoma: National Archaeological Museum, Naples: Barbara McManus). From here. Harpokrates. 1) Aegypt. etwa: Har-pe-chrod = Horus, das Kind, besondere Form des Gottes Horus. Wann sie zuerst vorkommt, ist nicht sicher festzustellen, seit der 26 Dynastie wird sie ziemlich häufig und besondere Verbreitung erhielt die Verehrung des Gottes seit der Einrichtung des Serapiskultes durch die Ptolemaeer in Alexandria. Da die verschiedenen Formen des Gottes Horus schwer ausemanderzubalten sind, werden alle zusammen unter Horus behandelt werden. Harpocrates. 1) Egyptian. I.e. Har-pe-chrod = Horus, the child, a special form of the god Horus. It is not certain when he first appears, but from the 26th dynasty he becomes quite frequent, and the worship of the god receives special encouragment after the establishment of the cult of Serapis in Alexandria by the Ptolemies. Since the various forms of the god Horus are difficult to separate, they will be treated all together under “Horus”. Posted in From my diaryTagged Acharya S, Harpocrates, Methodology2 Comments on Who the heck is Harpocrates and why is he “really” Jesus? I’m going to start looking at Acharya S, Christ in Egypt, a crank volume which I found myself turning into PDF a couple of days ago. But first, a few words about how I always approach such things. Every Christmas the internet is full of stories which rewrite Christian origins to show that (a) the Christians and their bible are wrong and (b) Jesus was really a <insert idea here>. The replacement story varies wildly. If you look at the archives of newspaper reviews of books, you will find many, many “real Jesus” stories; Jesus the spaceman, Jesus the revolutionary, non-existent Jesus, and many, many more. Once you know how many different versions there are, you rate each example very low. Now the ancient data is what it is. So all these narratives are fabricated in the same way. The authors invent a story. Then they look at the bible, and early Christian writers, and maybe ancient data in general. They do so with a scalpel. They find excuses to ignore whichever portions of the narrative may be inconvenient – sometimes to ignore the entire data base! – leaving only scattered snippets of information that can be made to fit into their imaginary, pre-determined narrative. And … once the data has been mutilated to fit, they claim that this is the “real” story. As a teenager I remember reading Chariots of the Gods. It had a cosmic-looking cover, and a friendly, relaxed, chatty writing style. I was too young to see what was wrong with it. But really it was quite convincing. It did dismiss “experts”. All these books tend to do that, unless they are written by academics peddling some theory. However it did so in a mild and unaggressive way. But it did the same trick; selected pieces of data, that could be made to fit a theory, and ignore everything that contradicted it. On Christmas Eve, I created a PDF of Acharya S’ Christ in Egypt. Then, as I often do, I created a set of bookmarks for the chapters, so that these 600 pages were not just one intimidating wodge of text. The chapter titles make her aim clear – to assert that Jesus is really … drum-roll … Horus (?!). I’m sure that Egyptologically-minded people will have burst into laughter. But that’s the object of this fussy, obsessive book. I already know, as you see, how she will do this. How do we respond to this kind of falsification? Well, before we decide that some novel idea actually is a falsification, it’s a very good idea to actually find out whether it is actually wrong! We’re not in the business of mindless rote repetition of whatever ideas about antiquity were current when we were receiving our education. Usually the best thing to do is to assemble all the ancient data about the person in question, read it; and then, and only then, go to the article or book peddling a theory, and see what it has to say. So if we hear certain strange people in the USA claiming, for instance, that “Cleopatra was black”, what we do is to assemble every reference in ancient literature to Cleopatra. Once we have that, we look through it to see if there is anything that supports this claim. Once we know that it does not arise from the data base, we are justified in rejecting it as a modern invention; whatever clever trickery may be used to advance it. But before we do this, there is a snare. We must first work out what the claim being made is. We must get it, phrased as a sentence, in our own words, which we can then test in this manner. For some of these writers can be very convincing, if you read their prose. 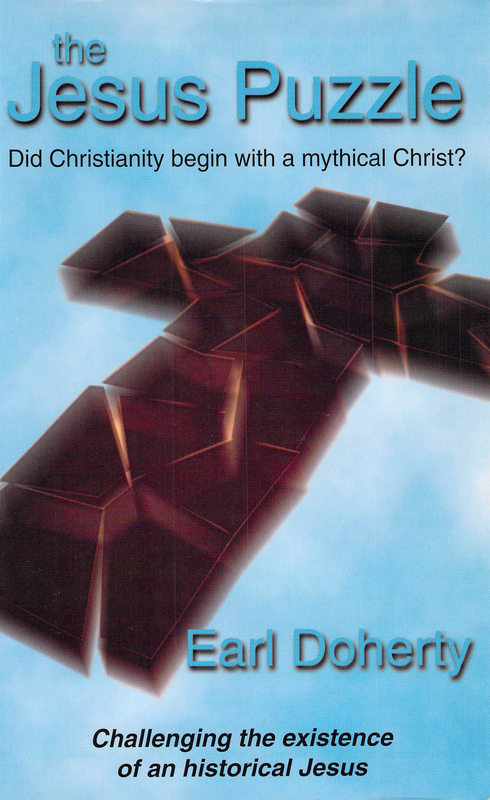 There was an amateur atheist named Earl Doherty – I suspect he was probably an American, rather than an Irish peer – who wrote a now forgotten book called The Jesus Puzzle, aimed at showing that … I don’t even recall now. It was canvassed quite energetically by atheists around 2000. I came across it because it made claims about Minucius Felix, which I happened to see. His writing style was terribly convincing; if you allowed him to lead you through his argument, the sound of the words would lull your critical senses to sleep. The thought that this was wise, the urge to sound wise yourself by agreement, is a trap for the enquirer. Skim the book. Read the conclusion first. Work out what the claim is; and then how to test it. Once you have mastery of the data base, then you may read the book; and you will quickly see the way in which the author honestly presents the data; or softly leads you off into the bushes. In the case of the Doherty book, I learned that one of his claims was that nobody before 200 thought that Jesus was God. Argument from silence, of course; but was it even correct in the data? What I did was to find an e-text of all the 2nd century writers, and search them for mentions of “Jesus”, “Christ”, “God”, using ctrl-F in my browser. There are only ten. At the end of this, I had a set of quotes; and definite evidence to the contrary. Doherty wasn’t very clever, tho. Like many of these people, he was taken in by his own supposed cleverness, to the point of blindness. So he claimed that Minucius Felix wrote around 150; in order to claim that what Felix did not say was evidence. As it happens opinion among scholars is that he wrote around 230, based on his use of Tertullian. But Doherty wouldn’t have that, whatever he was told! 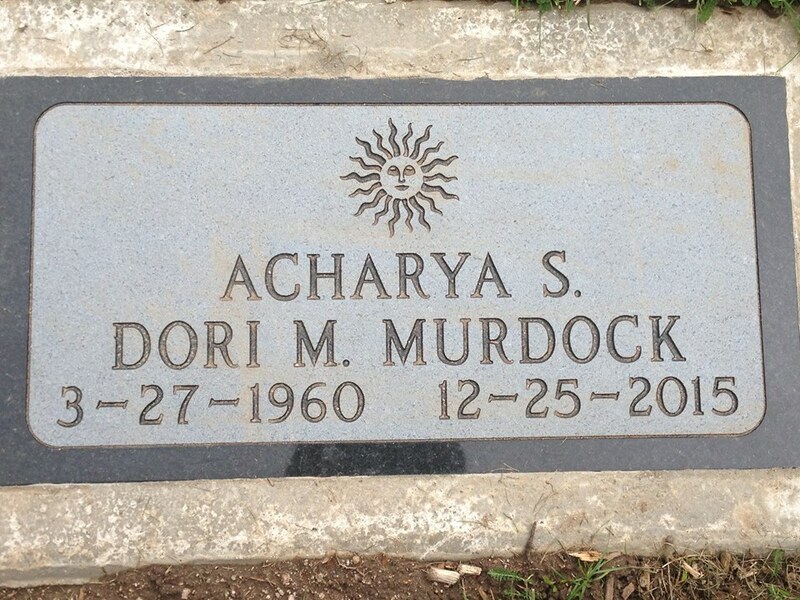 Returning to Acharya S, her book is a version of the “pagan Christs” theory, put forward by ignorant people sporadically over the last 150 years, and propped up by whatever careless quotes they can find. The theory claims that Christianity is copied from paganism. They claim this out of spite, knowing that it will enrage modern Christians who all reject taking doctrine from anyone but Christ. Few, one discovers, have any real interest in ancient history. As with much atheist invective, it is in fact a bastardised version of 19th century protestant anti-Catholic argument. The early church certainly was very careful to avoid anything pagan. But the medieval church, in its position of enormous power and intellectual strength, took a different approach towards the primitive paganisms that it encountered in its march to the modern world. To ancient and modern Christians, conversion is about individuals. But in the medieval period, men were merely parts of tribes. Kings might be converted; but the community was all. So the medieval church sought to convert whole communities, and accepted that this might be ragged at the edges. St Augustine of Canterbury, going to pagan England, was advised to build his church on the site of a pagan temple, so that the people’s habit would tend to take them to the temple. Likewise festivals might be repurposed, and saints’ days created to overlie older celebrations. The clergy were important, and the church made more effort to ensure they thought correctly; the mass of the people much less so, and doing the right thing mattered more than doctrine. So there are indeed signs with popular catholicism in some countries of observances that may have originally had some now-forgotten pagan significance. And it does not matter. They really did blot out the old paganism. Anti-Catholic literature in the 19th century made great play of how Catholicism was “really pagan”, making use of such items as these. Atheist literature of the 20th century simply made the same assertions about protestant Christianity, ignoring the enormous differences. With all this in mind, I shall start looking in my next post at Christ in Egypt. Among the nonsense that circulates on the web is an interesting claim, which may be found in the old online Catholic Encyclopedia, and spread into atheist literature via the medium of Joseph Wheless’ Forgery in Christianity.. It is perhaps most accessible today by means of the Christ Conspiracy by a certain Acharya S., a poor woman who has seemingly managed to read uncritically incredible amounts of unreliable books, without acquiring any critical sense in the process.. The various corrupt versions of the Catholic Encyclopedia material will doubtless be professionally interesting to the textual critic, who may see therein the process of transmission by careless scribes beautifully exampled. Finally, at the top of the hierarchy were the Fathers, who appear to have presided over the sacred ceremonies (pater sacrorum). The chief of them bore the title of Pater Patrum , sometimes transformed into Pater patratus  in order to introduce an official sacerdotal title into a sect which was Roman by naturalisation. These Grand Masters of the adepts retained until their death the general control of the cult. 1. Pater patrum, cf. t. II, 535, col. 2. One became pater patrum after being an ordinary pater, cf. inscr. 14, 15 and note, and also 13 and note. — the Marcellinus leo of inscription 45 is perhaps the same person as the Domitius Marcellinus of inscr. 31. — the title of pater nomimus (inscr. 166 and note) seems to be an ordinary Father, as opposed to the Pater Patrum. 2. Pater patratus, inscr. 190; cf. however 514: Pater patratum leonem, which I cannot explain. Patratus cannot be considered as a collective, despite the expression ob honorem sacri matratus of inscription 574 b. 3. Inscr. 13 and note, 15 and note. This material is what lies behind the statements in the C.E., which thus merely serve to popularise. (The title pater patratus is an ancient one which appears in Livy for a fetial priest with powers to make a religious oath on behalf of the Roman people to conclude treaties, so perhaps might be translated as executive father). The material given is unsatisfactory as evidence for the large claims made. Page 535 is merely the index to all mentions of the term, 14 of them. Inscription 13 relates to CIL VI 754, set up between 357-362 A.D. by Nonius Victor Olympius, which does not seem to refer to him as a simple pater. Inscr. 14 and 15 are the monuments of Vettius Agorius Praetextatus from 387 A.D. The latter monuments certainly do not support Cumont’s claim that a Pater Patrum was first a Pater (however probable this would otherwise seem to be). Neither state, as Cumont does, that the role consisted of a general direction of the cult as a whole. Inscr. 190 is CIMRM 706, in Milan, where P. Acilius Pisonianus is labelled pater patratus, dedicates a Mithraeum with funds from the municipality of Milan after a fire. But there is no indication that this title is the same as pater patrum. Inscr. 514 is a 3rd century inscription in Spain (CIMRM 803), where presidente patrem patratum leonem, is the perfect Father of the Lions presiding. As so often with Cumont, the evidence simply does not support the claims made in the text. Wild imagination extrapolates what might be true from the rather less exciting raw data. None of this material takes us further forward. We can speculate ourselves. The Pater Leonem is, quite possibly, simply a pater with supervisory responsibility for the initiates of the grade of leo or Lion. By analogy, a Pater Patrum would simply be the senior pater in a Mithraeum. Given the military links of the cult, that a single individual would lead each grade, and perhaps the Mithraeum as a whole, seems inevitable, just as the centurions were led by a primus pilus in the legion. This all fits the data admirably, and gives rise to none of the exciting claims of a “Mithraic Pope”. Do we need to suppose the existence of such a figure? Even if we refer to a “High Priest of Mithras”, which might have existed … do we need to suppose that there was one? What evidence requires it? Or should we, perhaps, see in the pater patrum the equivalent of the Christian bishop, responsible for the temples in a city? We could; but what evidence requires this? When we know nothing, it is really, really important not to speculate. The data we have indicates very little. A useful 1982 article by Peter Herz in ZPE  lists all the monuments that refer to a Pater Patrum. There are fifteen of these in all. Eleven of these are from Rome. The majority are late Roman noblemen. It is, in truth, a thin collection of data. I hope to review it all at some subsequent point.